This episode revisits the theme of “acceptance” (see “Monster Detectives”), but in a slightly different way. Uniqua, Pablo, and Tyrone cannot agree on what adventure they should play for the day. When Tasha suggests a tea party, the trio cannot imagine how drinking hot leaf water could be as exciting as racing or mountain climbing. The search for the perfect cup of tea, however, turns out to be quite a thrilling adventure. One important thing to note in “High Tea” is that Pablo, Uniqua, and Tyrone aren’t disrespecting Tasha when they initially dismiss her idea. It’s not because Tasha is a girl (Uniqua siding with the boys helps with that) or something similar, but that they’re skeptical of any activity that doesn’t automatically sound interesting. It’s a bias that most children tend to have, especially when such games conflict with their usual interests. The trio accept Tasha’s party invitation reluctantly, unsure of how sitting around sipping tea can be fun. Of course, this episode is really more about the journey than the destination. 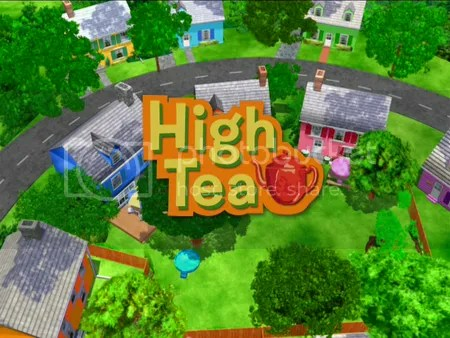 The characters sing, dance, and zip-line their way through a number of countries as they find each ingredient for the perfect cup of tea. In the concluding moment of reflection, Tyrone, Pablo, and Uniqua are surprised by how much fun they all actually did have, and realize that accepting others’ ideas doesn’t have to be boring. On the aesthetic side, “High Tea” is one big mish-mash of different cultures. The music is Traditional Irish Folk, which by its nature seems out of place in any setting other than Ireland, yet the composer makes it work, even as the characters travel through the rainforest of Borneo [in Indonesia/Malaysia] and the Gobi Desert. The characters also go to China, another nation known for its tea, and end up in the desert region it shares with Mongolia. The first song’s title references England, perhaps the place most Westerners tend to associate with tea-drinking. Interestingly, “Pip, Pip Cheerio” is set to the tune of “There’ll Be a Hot Time in the Old Town Tonight,” though sports fans may be more familiar with it as the fight song of Texas A&M University. The best song for kids to sing would probably be “The Galloping Song,” since it’s pretty much the only one that can be sung out of context, and is also very catchy. How do you help your child with the acceptance of new ideas or games?